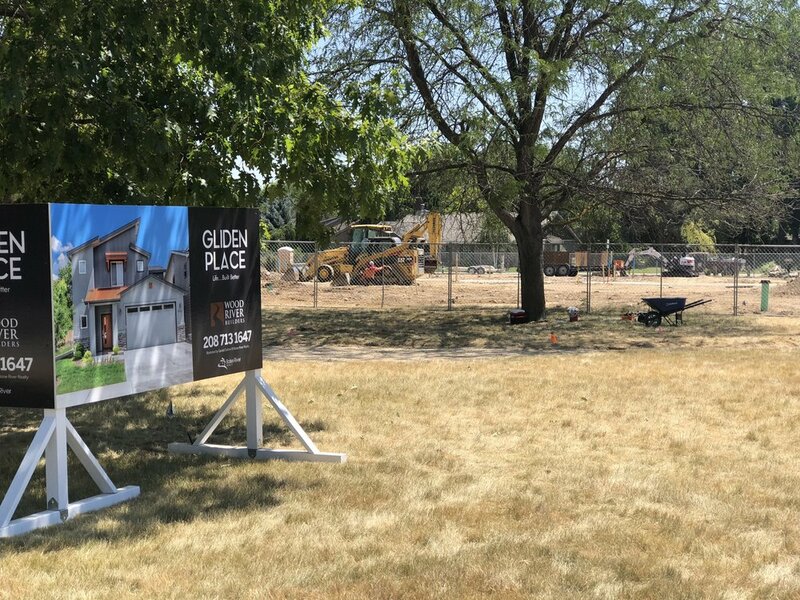 A long-vacant parking lot in southeast Boise is being replaced with 13 new homes, with construction already underway. The former Trinity Presbyterian Church at Gekeler St. and Linden moved to Surprise Valley and its building converted to the Lakweood Montessori School. The former church sanctuary was torn down in 2013 – but a large parking lot for churchgoers was left behind. Now that lot has been torn up and soon a series of one and two-story homes will sprout up along a new private street, wrapping around the school – which will remain in place. The Glinden Place Subdivision was approved last year – following up on two prior developments for the site that didn’t come to fruition. (Side note: A sign on the project says it will be called “Gliden Place” – but the technical name is Glinden Place). Wood River Builders, LLC is responsible for the project, and is building the homes, and plans a small landscaped space and gazebo at the corner of Linder and Gekeler.